July 2016 - Perry Hood Properties, Inc. While you’re certainly aware that your roof plays a significant role, it’s likely not something you think about every day. Most homeowners can go months at a time without being concerned with the current state of their roof. Replacing a roof, however, is a significant investment and it’s helpful to have a few months to plan for it. That’s why it’s important to periodically check the health of your roof. When you do, here are a few things to check on. You don’t necessarily have to get the ladder out and climb onto your roof to start your investigation. 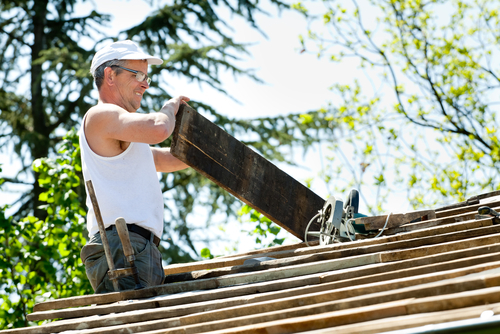 Your first step will be to determine the age of the roof. Typically, you can expect a roof to last about 20 to 25 years, however there are additional factors to consider. The number of layers of shingles and the ventilation will also impact the lifespan. Also, if the latest work done on the roof only laid new roofing over older layers, you’ll likely need to replace the roof sooner than 20 years. The state of your shingles have a big impact on how effective your roof is. While you’ll be able to spot some warning signs from the ground, it’s best to go up and taker a closer look. Curling or buckling is a common symptom of older shingles that need to be replaced. This will usually occur first on the side of your roof that receives the most direct sunlight. So, check that area first. If shingles there look good, your roof is probably still in good shape. But, it’s probably a good idea to check the rest of your roof for missing shingles that may have blown off in a storm. The flashing around your chimney is what keeps it from leaking. If it’s made up of roof cement or tar, it’s not likely to last as long as your roof. Eventually, you’ll want to replace it with a more permanent solution like sheet metal. Leaky chimney flashing is probably the most common roof issue, so it’s definitely something you should watch for. If you’re building a new home, request a high quality material be used for your chimney flashing. Finally, when you’re walking on your roof, does it feel solid, or is there a spongy feel to it. This could almost be similar to walking on a trampoline. This is a sign of weakened underlying decking. This is usually caused by moisture. Your next step will be to head to the attic to check for moisture in your insulation, and if there is any daylight being allowed through the roof boards. Replacing your roof is costly, but it’s a necessary investment. If you’re ready for a new home, contact us at Perry Hood Properties. We have a number of available homes throughout Tulsa, Broken Arrow and Bixby, and can also start construction on your custom home.